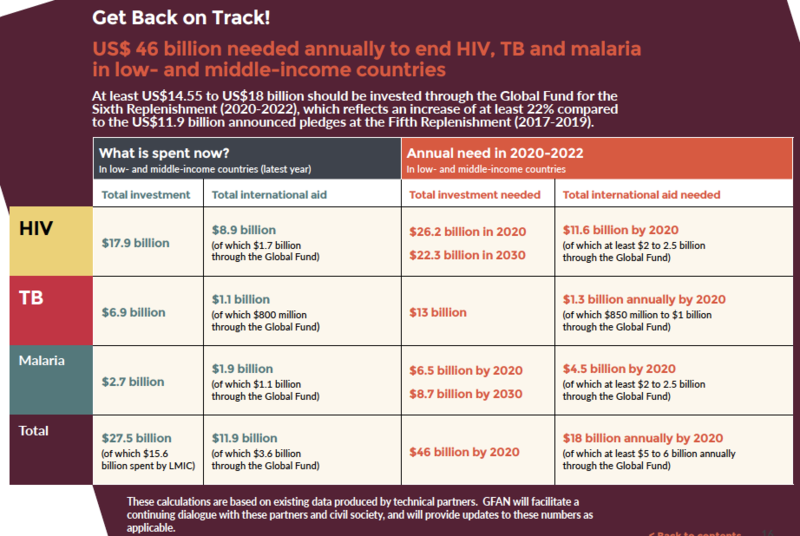 Citing concerning epidemiological trends (slowing or too-small reductions in infections and deaths from AIDS, TB, and malaria) and data showing that even current levels of international assistance for the three diseases will be insufficient to reach global targets, the report calls for the global community to “get back on track.” For GFAN, getting back on track means substantially increasing the contributions of donor (and implementer) countries for disease control efforts, much of which could be done through expanded pledges to the Global Fund in next year’s replenishment drive. The centerpiece of the report is a bold, yet well-documented, statement of need for global financing for the three diseases over the 2020-2022 period, which will be funded through the Sixth Replenishment (see image below). For the Global Fund in particular, the report argues that donors need to increase pledges by at least 22% over the prior replenishment, which was launched in Montreal in September 2016, and covered the 2017-2019 period. A note about the above graphic: Days after the report was published, the Stop TB Partnership presented updated calculations of need for the global TB response. At the 2018 International AIDS Conference, Stop TB stated that, in fact, $65 billion is needed for TB responses for 2018-2020, representing a doubling of the current level of investment. According to these new figures, at least $14 billion is needed per year starting in 2020, with at least $1.6 billion being channeled through the Global Fund. GFAN issued a press release reflecting these updated figures at the conference. To illustrate its claim that the world is off track in its efforts to meet the Sustainable Development Goals of ending the epidemics of HIV, TB, and malaria by 2030, the report highlights six concerning trends. At the top of the list is the fact that the largest-ever generation of adolescents and young women (recently referred to at AIDS 2018 as the “demographic bulge”) is facing a host of threats to their health and overall well-being and security. More than 350,000 adolescent girls and young women are still becoming newly HIV-infected in low- and middle-income countries each year. These infection rates stand in contrast to the falling rates among many other populations, “signaling potential for resurgence of HIV epidemics as cohorts of young people expand.” If the world fails to get a handle on controlling HIV in these populations, the report argues, then the entire project of ending HIV is unlikely to come to fruition within the next 12 years. Another key threat to success is the abiding neglect by health systems of key and vulnerable populations for all three diseases. The report cites new data from amfAR: the foundation for AIDS research which describes that 80% of new HIV infections outside sub-Saharan Africa and 25% of those within sub-Saharan Africa are occurring among key populations and their sexual partners. People living with HIV and other key populations are also at substantially elevated risk for acquiring and dying from TB. And migrants—an ever-growing global population—continue to have some of the highest risk levels for HIV, TB, and malaria. But despite their growing profile in global health discourses, key populations are still not receiving appropriate levels of funded interventions for the three diseases, and are at particular risk for being left behind in some middle-income countries where donors such as the Global Fund are rapidly exiting, leaving them to fend for themselves against often unfriendly governments. A corollary to the neglect faced by key populations is the increasing regularity with which human rights are being attacked. As the report highlights: “Leading global measures of human rights have reported worsening rights-related situations in every region of world.” The report acknowledges the central role of human rights to the achievement of the SDGs, those which are health-related and otherwise. While there is an unfortunate global trend against respect for universal human rights, the report does point to the Global Fund as a key influencer in support of human rights, through its requirements that recipient countries respect peoples’ rights and support non-discriminatory approaches to health. Two of the other top-line ‘hazards’ relate to medicines: drug resistance is on the rise at the same time that access to medicines is under threat. The two hazards are indelibly linked. At the same time that some corporate and government entities are seeking to “extract maximum profits” for life-saving drugs, the report argues, efforts to mitigate increasing resistance to some essential medications are not being sufficiently developed or implemented. This combination represents a major challenge to current efforts to control the epidemics, let alone the necessary scaling up for which the report calls. Finally, the international assistance equation is evolving out of sync with global need. As many countries with major epidemics of HIV, TB, and malaria transition from low- or lower-middle income into higher economic classifications, the rationale donors use to make investments becomes weaker. There is a sense of punishing success in this arrangement. Reducing donor investments in middle-income countries just as they are approaching tipping points in controlling their epidemics threatens to set back their progress, with potentially “disastrous results,” as the report argues. The report highlights the unfortunate reality that “over 70% of people living with the three diseases live in countries with over-burdened health systems.” Regardless of income classification, and in spite of growing domestic investment in many countries, low- and middle-income countries remain largely dependent on international aid to combat their epidemics, as described in the table below. Table 1. International aid in low and middle-income countries. From Get Back on Track to End the Epidemics. The report calls for “immediate action” to get back on track, and lays out five plans for doing so, each targeting a specific stakeholder group. Because the report describes these plans with exceptional brevity and pointedness, we have chosen to reprint the original text for GFO readers. Donor governments and implementing countries should recognize the urgency and peril of the situation and mobilize resources without delay. The technical partners have estimated the total funding need for AIDS, TB and malaria at US$46 billion annually, of which GFAN estimates that at least US$14.55 to US$18 billion should be invested through the Global Fund for the Sixth Replenishment (2020-2022). This would reflect a minimum increase of 22% compared to the US$11.9 billion announced pledges at the Fifth Replenishment (2017-2019). This requires donor governments making increased pledges—as early as possible—to the Global Fund’s imminent replenishment for 2010-2022. Policy experts and decision makers must acknowledge, articulate, and draw attention to the ways in which HIV, TB and malaria efforts are off-track and update strategies to bring epidemic responses back on course to ending the three epidemics. Global technical partners, notably WHO, UNAIDS, and the Stop TB and Roll Back Malaria partnerships, must re-examine current progress and challenges and recalculate current epidemic trajectories and global resource needs. The Global Fund, given its record of success and central role in financing epidemic responses, should be ambitious in setting replenishment targets for the 2020-2022 funding cycle and be forceful in communicating the costs of inaction. Advocates should boldly demand increases in international aid for health, including for programs against HIV, TB and malaria, and should press all governments to build resilient and sustainable systems for health and commitments to health for all. While the authors of many advocacy documents cross their fingers and hope that others will make use of the statistics and arguments they present, GFAN took this a step further with the Get Back on Track report. Rather than simply write and release the report, GFAN has made available a suite of supporting documents for advocates to use to expand the utility and impact of the report. On the report’s webpage readers will find pre-made templates for a press release and social media posts, as well as graphics, images, power point slides, and ‘key talking points,’ to be used at their own discretion. In addition, the executive summary is provided in French, Spanish, and Russian. Although not detailed in this article, data-heavy ‘spotlight’ sections on each of the three diseases are also included in the full version of the report, which may serve as further ammunition for advocates seeking to build their cases with this report. The report and supporting documents represent a poignant and coordinated effort to influence the Global Fund’s Sixth Replenishment drive, which begins early next year. This is in alignment with GFAN’s mission to support advocacy around increasing donor pledges for the imminent, as well as past, replenishment drives.